Objective To determine the sociodemographic factors associated with cervical cancer screening and follow-up of abnormal results. Participants Women between the ages of 18 and 70 years who were eligible for Papanicolaou testing. Main outcome measures Rates of cervical cancer screening and follow-up of abnormal and inadequate Pap test results, and associated sociodemographic factors such as age, neighbourhood income level, and health region. Multivariate logistic regression was used to identify independent factors associated with screening and follow-up. Results Of the 3.7 million women eligible for screening, 69% had had Pap tests in the past 3 years. These rates varied by age, income, and region (P < .001). Women residing in the lowest-income neighbourhoods were half as likely to be screened (odds ratio 0.56, 95% CI 0.55 to 0.56). Only 44% of those whose Pap test results revealed atypical squamous cells of uncertain significance or low-grade squamous intraepithelial lesions had repeat Pap tests or colposcopy within 6 months, and this varied by age, income, and region (P < .001). Among women with unsatisfactory Pap test results, only 35% were retested within 4 months, and this varied by age (P < .001). Conclusion Despite universal health coverage, cervical cancer screening rates are suboptimal among low-income women at greatest risk. Follow-up among women with inadequate or abnormal test results is often poor. Novel models of cervical cancer screening are needed to address these inadequacies. Little is known about the follow-up of abnormal results. Yabroff et al5 identified 21 observational studies of follow-up for abnormal Pap test results. The subjects came from clinics, programs, or health systems; there were no population-based data. Their conclusion was that the poor quality in follow-up of abnormal findings threatened the effectiveness of mass screening programs.5 Bastani and colleagues6 created the Model for Intervention Research, Dissemination, and Implementation using information from this work. In the model, a country’s health care system is conceptualized in terms of policy, practice, provider, and patient. In Ontario, policy was involved in the launch of the Ontario Cervical Screening Program7 and screening guidelines.8 In this paper we examined the quality of this program. Patient factors that we assessed included age, socioeconomic status, and regional variation. This study builds upon findings from the Cancer chapter of the Project for an Ontario Women’s Health Evidence-Based Report.9 This is a population-based, retrospective cohort study that used administrative sources of health care data. CytoBase captures cervical cytology assessments from participating laboratories, hospitals, and clinics, and currently captures approximately 90% of Ontario’s cervical cytology information.7 The Ontario Health Insurance Plan (OHIP) database contains all billing claims by Ontario physicians. Women with previous diagnoses of cervical cancer were identified from the Ontario Cancer Registry. The Canadian Institute for Health Information’s Discharge Abstract Database, which lists diagnostic and procedure codes from all inpatient and outpatient hospital admissions, was used to identify prior hysterectomy. The Registered Persons Database (RPDB) contains demographic information on all residents of Ontario eligible for OHIP. The Statistics Canada 2001 Census provided neighbourhood income quintiles for this study. The study population consisted of women between 18 and 70 years of age who were permanent residents of Ontario and eligible for full health care coverage under OHIP during 2004 and 2005. Women were excluded if 1) they had previously been diagnosed with cervical cancer or 2) they had undergone hysterectomy. follow-up of unsatisfactory Pap test results. Cervical cancer prevention indicators selected by the POWER technical expert panel: Full cohort definition is described in text. Data sources for each indicator are shown in parentheses. Covariates included age at the time of the Pap test (taken from the RPDB). To calculate neighbourhood income quintile, we linked data from Statistics Canada’s 2001 Census with postal codes from the RPDB, using a postal code conversion file to construct community income quintiles.10 Patients were assigned to regions based on their place of residence using the RPDB. The province of Ontario is divided into 14 regions, which are defined based on patterns of tertiary care referral. All analyses were completed with Statistical Analysis System, version 9.1.3. All indicators were reported at the provincial level then stratified by age, income, and geographic location. Data with missing income and Local Health Integration Network (LHIN) information were excluded from the analysis. Overall provincial results and results by age were reported as crude proportions. Proportions compared by income quintile or region were indirectly standardized for age using the respective overall cohort. Crude and age-adjusted rates were similar, so for the purposes of this report only age-adjusted rates are presented. Results were also corrected for prior hysterectomies. Because data for this are only available from 1988 onward, before this time, the hysterectomy rates were adjusted by the cumulative probability of undergoing a hysterectomy as previously described.11 A sensitivity analysis was also conducted on the 2 indicators evaluating follow-up of abnormal results extending the time for follow-up to 6, 8, and 12 months. Logistic regression was used to evaluate the relationship between age, neighbourhood income level, and region and cervical cancer screening and follow-up of abnormal results. Three separate models were created, corresponding to the 3 quality indicators. There were 3 713 531 women who were eligible for at least 1 Pap test in Ontario during 2004 to 2005. Details for each indicator are reported below. Sixty-nine percent of eligible women had 1 or more Pap tests in the preceding 3 years. There was variation in the screening rates by age (Figure 1A), with the youngest women (18 to 24 years of age) having the lowest screening rate (P < .001). There was variation in screening rates by neighbourhood income, which ranged from 61% to 75% in women from the lowest- to highest-income neighbourhoods (P < .001) (Figure 1B). There was a 10% variation in screening rates by region (P < .001) (Figure 1C). 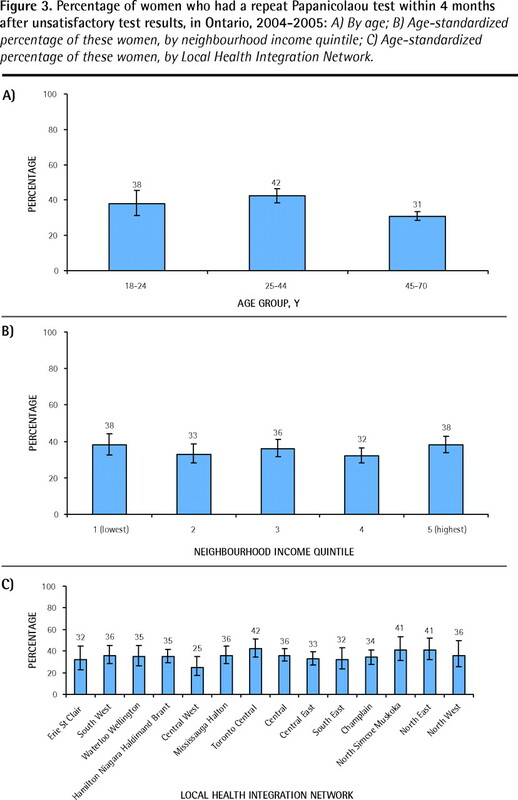 In multivariate analysis (Table 2), age, income, and region were independently associated with the probability of having undergone screening. Very young women (18 to 24 years) were the least likely to undergo screening. There was a clear and stepwise inverse relationship between neighbourhood income level and screening rates, with women who resided in the lowest-income neighbourhoods being significantly less likely to be screened than women in the highest-income neighbourhoods (odds ratio = 0.56, P < .001). Percentage of screening-eligible* women who had at least 1 Papanicolaou test in the past 3 years, in Ontario, 2004–2005: A) By age; B) Age-standardized percentage of these women, by neighbourhood income quintile; C) Age-standardized percentage of these women, by Local Health Integration Network. *Women between the ages of 18 and 70 years with no history of cervical cancer or prior hysterectomy. Overall, 44% of women who had an ASC-US or a low-grade squamous intraepithelial lesion Pap test result had a repeat test or colposcopy within 6 months of the initial test.4 A sensitivity analysis showed that the rate of follow-up increased to 67% and 80% by 8 and 12 months, respectively. Very young women (18 to 24 years old) were the least likely to have follow-up by 6 months (41% compared with 46% in the other age groups) (Figure 2A); this persisted at 8 and 12 months. 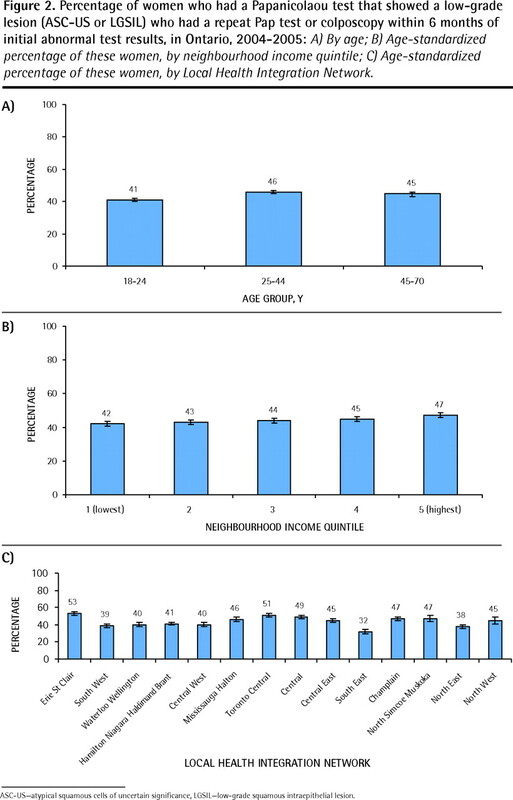 There was a modest income gradient with a 42% follow-up rate in the lowest-income neighbourhoods compared with 47% in the most affluent neighbourhoods (P < .001) (Figure 2B); this persisted at 8 and 12 months. There was a 20% regional variation (32% to 53%) in follow-up of abnormal Pap test results (P < .001) (Figure 2C), which persisted at 8 and 12 months. 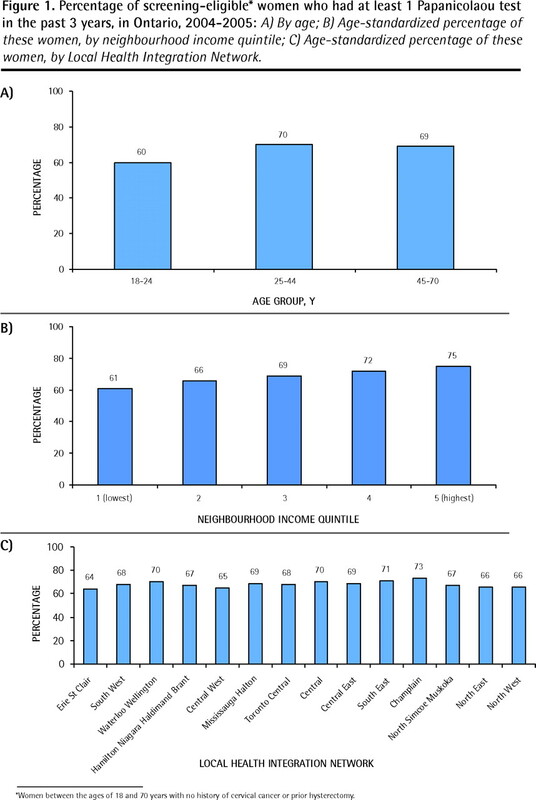 In multivariate analysis, age, neighbourhood income level, and region were all significantly associated with follow-up of abnormal Pap results (P < .001). The youngest women (18 to 24 years) were slightly less likely than older women to have follow-up. Follow-up of low-grade abnormalities was worse among women residing in lower-income neighbourhoods compared with those in higher-income areas (odds ratio = 0.85, P < .001). Percentage of women who had a Papanicolaou test that showed a low-grade lesion (ASC-US or LGSIL) who had a repeat Pap test or colposcopy within 6 months of initial abnormal test results, in Ontario, 2004–2005: A) By age; B) Age-standardized percentage of these women, by neighbourhood income quintile; C) Age-standardized percentage of these women, by Local Health Integration Network. ASC-US—atypical squamous cells of uncertain significance, LGSIL—low-grade squamous intraepithelial lesion. Only 35% of women who had unsatisfactory Pap test results had repeat Pap tests within 4 months. A sensitivity analysis showed rates of 37%, 48%, and 55% at 6, 8, and 12 months, respectively. Women aged 45 to 70 years old were least likely to have repeat Pap tests (P < .001) (Figure 3A). There was minimal variability of this indicator in relation to neighbourhood income level (Figure 3B). Although rates were poor overall, there was a non–statistically significant geographic variability in rates of repeat Pap tests, ranging from 25% to 42% (Figure 3C). In multivariate analysis, only age was associated with follow-up of an unsatisfactory test result (Table 2). Percentage of women who had a repeat Papanicolaou test within 4 months after unsatisfactory test results, in Ontario, 2004–2005: A) By age; B) Age-standardized percentage of these women, by neighbourhood income quintile; C) Age-standardized percentage of these women, by Local Health Integration Network. We identified that among those women who attend screening, follow-up of abnormal test results is low. For women with ASC-US or low-grade squamous intraepithelial lesions, only 44% had either repeat Pap testing or colposcopy within 6 months and only 80% by 12 months. Of those with unsatisfactory Pap test results, only 35% were retested within the recommended 4 months. This is the first time in the literature that follow-up data for women with abnormal screening test results are reported from a population perspective. Age is clearly a risk factor for the development of cervical cancer, with increasing rates of disease in older women. In Ontario, rates of screening were poorest in young women. Rates of follow-up of abnormal Pap test results also appeared to be affected by age. Only one-third of women returned for repeat Pap tests after unsatisfactory Pap test results. Older women who were most likely to have unsatisfactory Pap test results were least likely to have follow-up tests for unsatisfactory results. Living in a lower-income neighbourhood appears to be associated with lower cervical screening rates and less follow-up of abnormal Pap test results. Gorey et al15 also found a higher incidence of cervical cancer among people living in lower-income neighbourhoods in Toronto, Ont. Our report implies that unique barriers to screening exist for women from lower-income neighbourhoods, and that these barriers are not eliminated by Canada’s universal health care system. Future research should investigate the unique needs of marginalized women. Nonadherence to follow-up guidelines after abnormal Pap test results has been associated with a number of factors, including younger age, ethnic minority status, less severe lesions, low health literacy, and, in some studies, economic strain (eg, transportation, child care).16 Investigators from other jurisdictions17,18 were able to increase follow-up rates among low-income women using targeted interventions. Ogilvie et al19 have shown the value of convenience and patient comfort for increasing follow-up rates in Ontario. The data presented here precede the implementation of the LHINs. Our data show variations among LHINs in terms of incidence of cervical cancer, screening rates, and follow-up of abnormal Pap test results. This information is a baseline for setting priorities and improving care, as well as for monitoring disparities over time. It can be used as a knowledge translation tool for evidence-based care. This is an opportunity to define regional systems to meet unique geographic challenges and help change women’s health in the future. The limitations of this work included the lack of information on marginalized groups. Also, the use of retrospective administrative data limits the level of clinical detail that can be applied. Pap tests analyzed by hospital-based laboratories are currently not captured in CytoBase, thus our Pap test rate might underestimate the real rate. We are currently not meeting screening targets for cervical cytology screening in Ontario, and there are sizable income and regional variations. Having a low-cost screening test is not sufficient, as many women who are screened are not receiving the recommended follow-up of inadequate or abnormal test results. It is not clear if this is related to lack of communication of results or failure to return for follow-up. There is a need to target at-risk women for screening and monitor the progress in closing gaps. In the event that follow-up cannot be improved, the implementation of other types of screening tests that have different test parameters might be one option. For example, the highly sensitive HPV test20 can allow the interval of retesting to be extended. This paper reveals that novel models are needed to address the inadequacies of the cytology-based system or the way in which testing is applied. This study was funded as part of the Project for an Ontario Women’s Health Evidence-Based Report study, which is funded by Echo: Improving Women’s Health in Ontario, an agency of the Ministry of Health and Long-Term Care (MOHLTC). This study was also supported by the Institute for Clinical Evaluative Sciences, which is funded by an annual grant from the Ontario MOHLTC. The opinions, results, and conclusions reported in this paper are those of the authors and are independent from the funding sources. No endorsement by the Institute for Clinical Evaluative Sciences, Echo, or the Ontario MOHLTC is intended or should be inferred. Many women who are screened for cervical cancer are not receiving the recommended follow-up of inadequate or abnormal test results. Age appears to be a factor in the lack of follow-up of abnormal Papanicolaou test results. Older women were most likely to have unsatisfactory Pap test results and were least likely to have follow-up tests for unsatisfactory results. Living in a lower-income neighbourhood was also associated with lower cervical screening rates and less follow-up of abnormal Pap test results. There are barriers to screening for women from lower-income neighbourhoods, and these barriers are not eliminated by Canada’s universal health care system. Data in this study show variations among Local Health Integration Networks in terms of incidence of cervical cancer, screening rates, and follow-up of abnormal Pap test results. This information can help to define regional systems to meet unique geographic challenges and help change women’s health in the future. Bon nombre des femmes qui ont eu un dépistage du cancer du col ne reçoivent pas le suivi recommandé lorsque les résultats sont inadéquats ou anormaux. L’âge semblait être un facteur pour le manque de suivi des résultats anormaux au test de Papanicolaou. Les femmes plus âgées étaient plus susceptibles d’avoir des résultats non satisfaisants au Pap test, mais elles étaient les moins susceptibles d’avoir des examens de suivi pour des résultats non satisfaisants. Le fait de vivre dans un milieu à faible revenu était aussi associé à un faible taux de dépistage cervical et à un manque de suivi lorsque les résultats du Pap test étaient anormaux. Il y a des obstacles au dépistage des femmes vivant en milieu défavorisé et ces obstacles ne sont pas éliminés par le système canadien de soins de santé universels. Les données de cette étude montrent des variations entre les Réseaux locaux d’intégration des services de santé pour ce qui est de l’incidence du cancer du col, des taux de dépistage et du suivi des résultats anormaux au Pap tests. Ce type d’information pourrait servir à instaurer des mesures régionales pour répondre à ces défis géographiques particuliers et permettre éventuellement d’améliorer la santé des femmes. Dr Elit contributed to data interpretation and wrote the manuscript. Dr Krzyzanowska contributed to data interpretation. Mr Saskin contributed to data extraction. Dr Barbera provided methodologic input into data acquisition, analysis, and interpretation. Ms Razzaq and Dr Yeritsyan contributed to data acquisition and interpretation, as well as drafted the study. Dr Lofters provided methodologic input into data acquisition, analysis, and interpretation. Dr Bierman contributed to data analysis and interpretation. All authors were involved in critically reviewing and editing the final manuscript, and all gave final approval of the version to be published.
. Canadian cancer statistics 2008. Toronto, ON: Canadian Cancer Society; 2008. Available from: www.cancer.ca/~/media/CCS/Canada%20wide/Files%20List/English%20files%20heading/pdf%20not%20in%20publications%20section/Canadian%20Cancer%20Society%20Statistics%20PDF%202008_614137951.ashx. Accessed 2011 Nov 22.
. Comparison of Papanicolaou (Pap) test rates across Ontario and factors associated with cervical screening. Can J Public Health 2005;96(2):140-4.
. Invasive cervical cancer: a failure of screening. Eur J Public Health 2008;18(2):162-5. Epub 2007 May 4.
. Mapping the future of primary healthcare research in Canada. Ann Fam Med 2008;6(1):89-90.
. Is the promise of cancer-screening programs being compromised? Quality of follow-up care after abnormal screening results. Med Care Res Rev 2003;60(3):294-331.
. Interventions to improve follow-up of abnormal findings in cancer screening. Cancer 2004;101(5 Suppl):1188-200.
. Ontario Cervical Cancer Screening Program: program report, 1997–2000. Toronto, ON: Cancer Care Ontario; 2000.
. Cervical screening: a practice guideline. Toronto, ON: Cancer Care Ontario; 2006. Available from: www.cancercare.on.ca/pdf/pebc_cervical_screen.pdf. Accessed 2009 Feb 9.
. Cancer. In: Bierman AS, editor. Project for an Ontario Women’s Health Evidence-Based Report. Volume 1. Toronto, ON: St Michael’s Hospital and the Institute for Clinical Evaluative Sciences; 2009.
. PCCF + version 3G user’s guide: automated geographic coding based on the Statistics Canada postal code conversions files. Ottawa, ON: Statistics Canada; 2001.
. The quality of cancer services for women in Ontario. Toronto, ON: Ontario Women’s Health Council; 2006. Available from: www.cancercare.on.ca/common/pages/UserFile.aspx?fileId=13712. Accessed 2011 Nov 22.
. Cancer system quality index—2006. Toronto, ON: Cancer Quality Council of Ontario; 2006. Available from: www.cancercare.on.ca/common/pages/UserFile.aspx?fileId=13228. Accessed 2010 Feb 7.
. Selected extracts from the OCSP program report 2001–2005. Toronto, ON: Cancer Care Ontario; 2007. Available from: www.cancercare.on.ca/common/pages/UserFile.aspx?fileId=13744. Accessed 2011 Nov 22.
. Association between socioeconomic status and cancer incidence in Toronto, Ontario: possible confounding of cancer mortality by incidence and survival. Cancer Prev Control 1998;2(5):236-41.
. Timeliness and follow-up patterns of cervical cancer detection in a cohort of medically underserved California women. Cancer Causes Control 2010;21(3):411-20. Epub 2009 Dec 31.
. The effectiveness of a community outreach intervention to improve follow-up among underserved women at highest risk for cervical cancer. Prev Med 2005;41(3–4):741-8.
. Does improving communication and information for women increase attendance at colposcopy in an inner city clinic? A randomised controlled trial. Eur J Gynaecol Oncol 2004;25(4):445-8.
. Access to colposcopy services for high-risk Canadian women: can we do better? Can J Public Health 2004;95(5):346-51.
. HPV screening for cervical cancer in rural India. N Engl J Med 2009;360(14):1385-94.